As depicted in GRAPH 2, the court's decisional record has become increasingly pro-prosecution over the past five years. For the most recent two year period, the court as a whole sided with the prosecution in 67% of the divided criminal cases. That's twice as frequently as it sided with the defense (33%), and notably more frequently than the court did over the entire five year period (58%). Stated otherwise, it is siding with the prosecution much more in the latter, more recent years of the five year period than it did in the earlier years. The progression from the last five years, to the last three years, to the last two years--58% pro-prosecution to 63% to 67%--is not insignificant. It may not reflect a wholesale reversal of an ideological pattern. But it is, nonetheless, an unmistakeable change. From a roughly balanced, moderately pro-prosecution record, to one that is clearly and increasingly strongly pro-prosecution. What is the source of this change? Let's take a look at the voting figures. 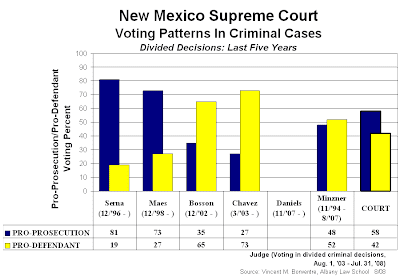 Interestingly, the court's most pro-prosecution member over the five year period, Justice Serna, actually became considerably less so in recent years. His 81% over the full five years dropped to 74% for the last three years, and dropped further to 67% in the most recent two years. Moreover, his record was the only one among the justices to move in a pro-defendant direction. The court's other strongly pro-prosecution justice became even more so in recent years. Justice Maes' voting record for the five year, three year and two year periods was 73%, 79%, and 83%, respectively. Not a dramatic pro-prosecution jump. But movement in one direction which was certainly not pro-defendant. Justice Minzner's voting record also seemed to move somewhat in a pro-prosecution direction overall. But as her 48% to 63% to 56% record for the five, three and two year periods reveals, her voting did not move consistently in a pro-prosecution direction. Also, her record for the entire five years was almost perfectly balanced (pro-defendant by one vote [12 to 11]), and her record for the most recent two years [actually, one year due to her untimely death in August 2007] was likewise almost perfectly balanced (pro-prosecution by one vote [5 to 4]). That leaves the two members of the court with the strong pro-defendant records over the last five years. Chief Justice Chavez did not alter course. 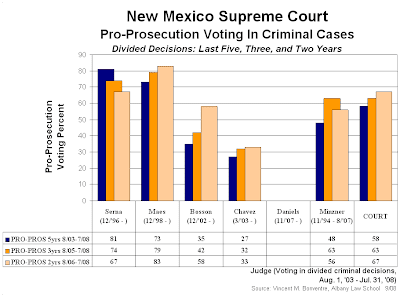 His voting--73%, 68%, and 67% for the five, three, and two year periods-- shows only the slightest proportional increase in pro-prosecution votes. He ended the five year period as he began: with a record clearly showing strong sympathies for arguments made on behalf of the accused. The story for the other member of the court with an overall pro-defendant record, however, is quite different. Justice Bosson's record shows a significant shift in voting. Indeed, his record changed over the course of the five years from strongly pro-defendant to moderately pro-prosecution. His voting record for the entire five year period was 65% pro-defendant. In the last two years it was 58% pro-prosecution. In short, though he voted nearly twice as frequently for the defense as for the prosecution over the entire five years, in the most recent years he has actually been siding with the prosecution most of the time. In sum, the fairly dramatic change in Bosson's voting record, together with the slighter change in Maes record, seems largely responsible for the decisional record of the court moving in a pro-prosecution direction. Indeed, moving from one roughly divided between pro-prosecution and pro-defendant rulings, to one which has been strongly pro-prosecution in the most recent years.